When people think of couples dance lessons they often think of ballroom dance lessons. There is nothing wrong with this thought. I happen to enjoy ballroom dancing and would recommend it to anyone interested in couples dance lessons. However most people fail to realize there are many styles of dance from which to pick. There is ballroom dance, salsa, country partner dances, argentine, polka, zydeco and my favorite of course swing. Which style of dance you choose to learn should be based on who you are and what you like. So, if you are considering taking couples dance lessons, first ask yourself these questions. “Do I like having fun?” “Do I like social environments where I can meet people and make new friends?” It doesn’t matter if you are single or married, do you like making friends? “Can I laugh at myself when I just don’t get it?” If you have answered yes, couples dance lessons are a good choice for you! Now, you should ask yourself some secondary questions. “Am I a more serious, romantic, proper kind of fun person?” Perhaps you should try Ballroom, Argentine or maybe Salsa dancing. “Am I a free spirited, like to laugh, goof ball kind of fun person?” If this is you perhaps you should try Polka, Zydeco or my favorite Swing. Age can also be a factor. 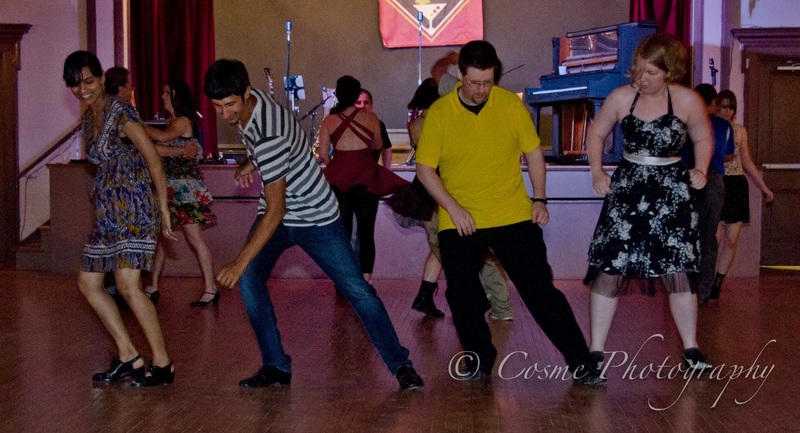 If you are younger, Swing dance crowds tend to be younger due to the athletic nature of many Swing styles. However I have danced Swing with people in their 90’s. If you are older, Ballroom crowds tend to be older as there are less physical styles you can dance in Ballroom. Of course everything is what you make of it. Ballroom can be quite physical as well and a challenge to young people. Click Here for Ballroom Dance Lessons. So, why is Swing so great for couples dance lessons? Well, if you find that you fit the goof ball profile. Swing is a dance style that thrives when it comes in contact with the goofy, unusual, free spirit. 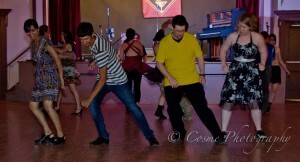 If one day you have tried all the styles as I have, you will find that no dance style compares to Swings fun factor. Yet I believe there is an even greater reason Swing should be one of your top picks. Ladies if you got a man and you want him to like dancing, Swing is the style that will hook him. There are a few reasons. One is that music you can Swing to includes early Rock-n-Roll as well as modern Rockabilly music. We’ll call this the cool factor. He may find love songs and waltzes to be a bit less manly though I would beg to differ. He also may not be interested in Salsa music if he is not Latin. Second, if your man struggles to get the beat or get his feet under himself Swing dancing is so lite hearted that he will find it easy to laugh off the situation. Instead of leaving class in frustration, he will leave as the big oaf you have already come to adore. So, when considering couples dance lessons, consider Swing! Sign up for classes Click Here! Moving Swing Kat from Pottstown PA to Spring City is proving to be a knock down drag out fight. However it is a fight we will endure to its end. I had a big meeting this week with the Spring City Borough Manager, their Engineer, their Codes Enforcer, their Lawyer, my Lawyer and my Architect. As you can imagine, it is costly to bring a group like this together and Swing Kat is paying the bill. Needless to say moving Swing Kat from Pottstown PA to Spring City is getting more expensive by the day. At this meeting I learned that the cost for a yes or no answer on whether or not we can proceed with our plans is now going to cost between $10 & $15k. I also learned about a number of more obstacles that are standing in our way. This thousand dollar meeting has left me with more questions than I had before we had the meeting. However, we are getting closer to the answers. I know it has been awhile since my last update on moving Swing Kat from Pottstown PA. The reason is that it took nearly a month to put together this meeting which finally happened yesterday. As I said we now know about more obstacles that stand in our way. Each one of these obstacles unfortunately has the power to stop our move of Swing Kat from Pottstown PA. However for the first time I feel like we have clear direction on how to proceed from here. 1. Because it has been 100 years since this building was last sold, the buildings zoning is listed as Un-Certified. What we were told this could mean is that even the slightest change in Use could cause us to have to comply with much greater code issue such as elevators & sprinkler systems. 2. Spring City has an unofficial moratorium on EDU’s right now from the Department of Environmental Protection. This is due to their sewer system needing to be upgraded. They have begun this process however it will not be complete for a few years which doesn’t help us. If the DEP requires us to have more than 1 EDU for our building it will end our ability to move forward. 3. Because we will need parking and have plans to put in a parking lot, we need to find out if the Planning Commission will require us to submit formal plans or not. If they do require this, the cost of preparing these plans, fees related to the process and time this process takes will all end this process for us. The only way around this would be for us not to put in a parking lot. However that would hurt us in our bid to get over the final obstacle. 4. Lastly, we need to get through a variance hearing as even with our new parking lot, we won’t have the required amount of parking. We will have roughly half the parking required by the codes book. This is no small matter and will be a tough road. There are more issues than just the number of parking spots. There is also the fact we can’t provide a driveway wide enough to meet the code. As well as the fact we can’t afford to pave the lot which is also required along with other issues. At this point we have spent over $4,000 of the $5,077 we raised for our move this past summer. So, I am now starting to pull money out of my own pockets, the money we were going to use to take care of the codes issues and parking lot once the borough gave us the go ahead. So, we need to continue raising money through 50/50’s, tea shirt sales and whatever else we can think of. Here is one more important note. Spring City is in favor of us moving Swing Kat from Pottstown PA into their borough. I have received nothing but kindness and well wishing from the community, the borough employees and borough council. Many have asked how they can help and others have already helped. Hopefully the obstacles don’t stop us. I will continue to follow this lead to it’s end (rule #2 in partner dancing) and see where it goes. Our swing dance classes in Allentown are moving. After 3 class sessions we have found that running dance lessons in Emmaus is not going to work for us. From the start we knew that these dance lessons should have been right in Allentown and not out in a suburb of Allentown. However having a good contact up in that region in Lynn Kettenburg and wanting to work with her led us outside of Allentown PA. Unfortunately being outside of Allentown is making it difficult to increase our standing in search engines leading to low class turnouts. Emmaus is also closer to Pottstown than we really wanted to be as more students will pick between the 2 dance studio locations. We have also found that we need to partner with an organization that has a large following. This is why we have partnered with the Allentown YMCA & YWCA to put of our swing dance classes in Allentown. So now we are truly holding swing dance classes in Allentown PA as the Allentown Y is in the city of Allentown. Though we have had trouble in running our lessons series, we have been getting nearly enough students to run our classes. As our standing in search engines increases over the next number of months our ability to run these dance classes will be greater. Add this to the fact we are joining with the YMCA, we should not have to cancel classes anymore! This move is about making sure we can deliver on putting swing dance classes in Allentown. When you sign up for class, we want you to be confident that your class will indeed run. Our move to the Allentown YMCA will do just that.